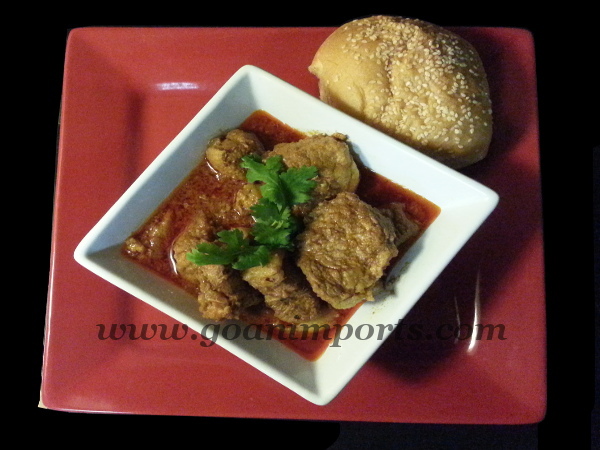 A quick and easy pork vindaloo cooked just as its done in Goa. The place of its origin. 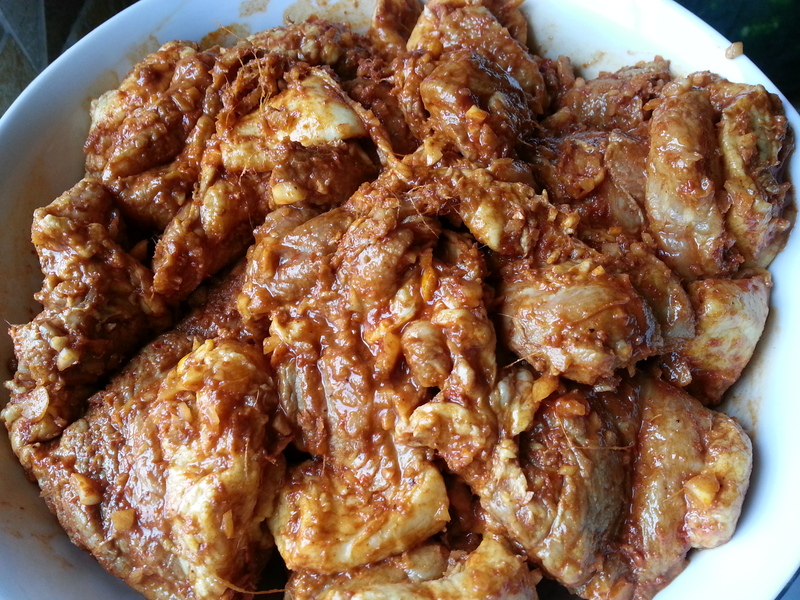 Vindaloo is a dish that is cooked most often for occasions and celebration. Traditionally it is made with pork meat and the spice mix is ground with coconut vinegar which gives its unique flavor. Being from Goa and away from home I have tried many of the vindaloo dishes but none have been able to compare, first it misses the coconut vinegar and second the gravy is not creamy or thick. The prep work needs to be done a day before for the best results. 2 lbs pork meat with a little bit fat. Cut the pork meat into 2″ cubes. Apply salt, seasoned vinegar, ginger, garlic, vindaloo paste and sugar, marinate overnite. Add 3 tablespoon of oil and slightly brown the onions. Add the marinated meat and saute for 3 to 5 minutes. Add a cup of water and salt to taste. Then cover and simmer gently, stirring occasionally, until pork is cooked through, about 40 minutes. Do remember for any type of curries “Its slow and steady that wins the taste“. It is served with steamed rice cakes called Sannas, but you can serve it with plain rice, pulao or french bread ( the chewiness) is similar to the Pao (Bread) that is made in Goa. Great recipe for a gluten-free diet, high protein diet. If you want to cut the fat in the recipe use lean pork meat. Can be cooked with chicken, beef, lamb, goat meats. Make you everyday food exciting. I am late again on this one. The ‘VINDALHO’ looks fabulous. You mentioned the ‘GOAN PALM VINEGAR’. That is the ingredient which gives food all the AROMA AND TASTE. Vinegar is like ‘LIQUID GOLD’. It acts as a presavative. We always carry a bottle or two to the UK. And therefore We always have vinegar in the house. The other thing You mentioned is the ‘GRINDING STONE’. Grinding stones were an important article in every Goan household in the days of old. But sadly, these days they are replaced by electric grinders/mixers/blenders. And the grinding stone has become a ‘WHITE ELEPHANT’, if You like. What a tragedy? And what a shame? But the grinding stone in Our house is still in place. And I guess We could still use it today. Things like the grinding stone and the well brings back happy memories. When in GOA I drawn water from the well. It is fun and a good form of exercise. My well in Margao is very deep. But these days the wells in Margao are comtaminated with ‘RAW SEWAGE’, and are not fit for human consumption. GOA is being murdered left right and centre. Anyway trust Me,We will give Your recipe a go. I will shoot emails to My comrades in England and Canada.I feel ‘ESCTATIC’ about Your recipes. This is my favourite Goan dish, thanks for the recipe. I am definitely gonna try it. Yes it is compared to how I grew up watching my mom make it where they would grind all the ingredients on the grinding stone.I know it sounds ancients 🙂 but that’s how it was. I hope you enjoy it. How flavorful this dish looks! I am sure that the masala blend is the key! 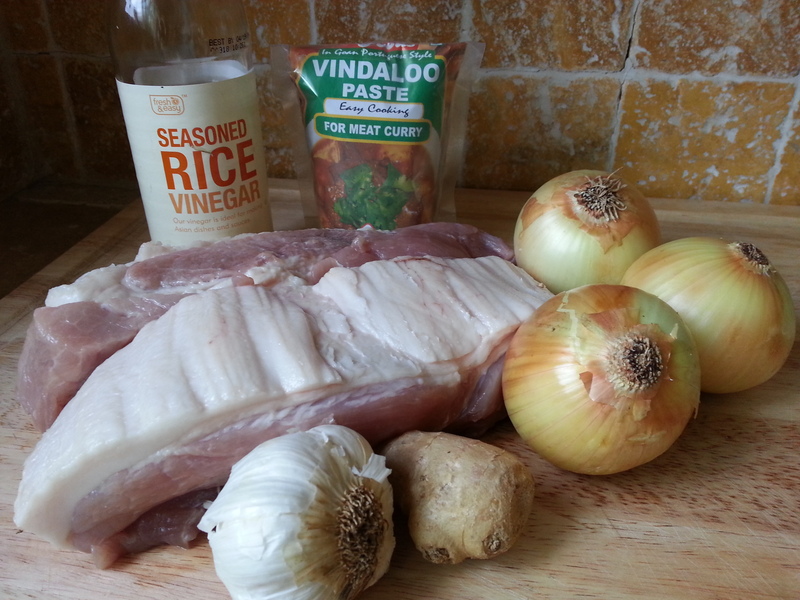 Yes Shanna :-), the coconut vinegar is the key for this recipe which is used to grind the spices.